The High Court has ordered an immediate shutdown of 14 private hospitals and diagnostic centers that operate illegally in Dhaka's Mohammadpur. Justice Sheikh Hassan Arif and Justice Ahmed Sohel issued the order with a rule following the hearing of a writ petition on Tuesday. The hospitals and diagnostic centers are located on Humayun Road, Babar Road and Khilji Road. BDM Hospital and Diagnostic Centre, Sebika General Hospital, Janasheba Nursing Home and Diagnostic Centre, Life Care Nursing Home, Royal Multi-Specialist Hospital, Nabab Siraj-ud-Doulah Mental and Drug Addiction Hospital, Monomita Mental Hospital, Plasma Medical Service and Clinic, Shefa Hospital and Diagnostic Centre, Islamia Mental Hospital, Crescent Hospital and Diagnostic Centre, Makka-Madina General Hospital and Diagnostic, New Well Care Hospital and Bangladesh Trauma Hospital. The High Court issued a rule asking why defendants' failure and inactiveness to stop the operations of the clinics and hospitals without licenses will not be declared illegal. The judges also asked why there will not be any directive to adopt legal steps against those persons associated with the 14 outlets. 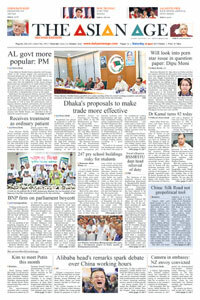 Health secretaries, the director general of the Directorate General of Health Services, the chairman of Bangladesh Medical Council, the Dhaka police commissioner, the chief executive officer of Dhaka North City Corporation, the chief of Mohammadpur Police Station and the executive magistrate of RAB have been asked to respond to the rule. Advocate Manzil Morshed moved the writ petition and Deputy Attorney General Mokhlesur Rahman Khokon represented the state. The High Court has ordered the immediate shutdown of the health service centers after the primary hearing of the writ petition. The director general of DGHS and the executive magistrate of RAB have been asked to implement the order. "Medical treatment is one of the fundamental rights of the people. People come to hospitals when they fall sick but they are supposed to have licences to run hospitals and provide health services. Otherwise, the owners are subjected to punishment. The administration remained inactive on the issue and we had to take the issue to court," said Manzil.